The laboratories that accompany Online Medical General Chemistry II are similar to those performed by students in a laboratory setting on any college or university campus, with one major exception. The experiments performed by online students will take place in their homes using LabPaq’s purchased through Hands-on-Labs, Inc.
Online Medical General Chemistry II Lab and all distance laboratories at UNE have been made possible by a nationwide effort over the last 40 years to move away from toxic substances and into microchemistry. These efforts have also resulted in safer laboratories that produce less pollution. 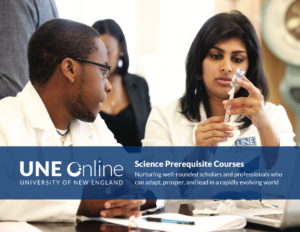 The laboratories are appropriate for introductory-level college General Chemistry II courses for pre-health science majors at challenging institutions. An emphasis is placed on understanding the concept of the laboratories and the scientific method since today’s healthcare professionals are expected to have a general understanding of how science and the scientific method contribute to their profession. The lab kit includes an introduction to each laboratory, relating the lab content to the corresponding course lecture. These labs are a good fit for pre-medical, dental, PA, DPT, pharmacy and nutrition students. General Chemistry II is designed for the student to take the lecture and lab concurrently in order to earn four credits. For the full four credits, you must register for both CHEM1011 and CHEM1011L. For students who only need a specific portion of General Chemistry II, however, you have the option to take lecture only (CHEM1011 three credits) or lab only (CHEM1011L one credit). Important: When selecting lecture and lab within FlexReg, please be sure that the section numbers match. In the event that there is no matching lab number, please select a different lecture, or contact an enrollment specialist. It is mandatory for students enrolled in lab to order a lab kit. The kit must be purchased directly through Hands-on Lab and cannot be purchased secondhand or from another vendor as the unique kit code is vital and is assigned to each student at the time of purchase. The kits MUST BE ORDERED IMMEDIATELY UPON ENROLLMENT in order to ensure materials are on hand for the start of the course. Note: Kits can take 5–7 business days to arrive. On or after your course start date, you can go to the HOL Cloud link posted in the Blackboard announcements to register for your HOL course using these directions. Do not start any experiments until you read the instructions within the individual course modules. Please do not order the LabPaq until you are certain that you will stick with the course. If you decide to return your LabPaq you will have to pay the return shipping charge plus a restocking fee. The Lab Paq needs to be purchased separately and is not part of your registration fee. What happens if a student messes up an experiment? Messing up an experiment is part of the learning process and as such should be noted. LabPaqs generally contain enough chemicals and supplies to perform each experiment twice. If a student completely blows an experiment and uses up all related supplies, replacement supplies can be ordered from Hands-On Labs, the maker of LabPaqs. Each lab has a corresponding 10-question quiz, and there is a laboratory final exam at the culmination of the course. All quizzes and the final exam are completed online. The cost of the materials is not included in this total.